Different people use Google Search for content which can be of varrying reading level. For example: a technical engineer would be looking for advanced level content whereas a school teacher would be looking for basic level content meant for children. 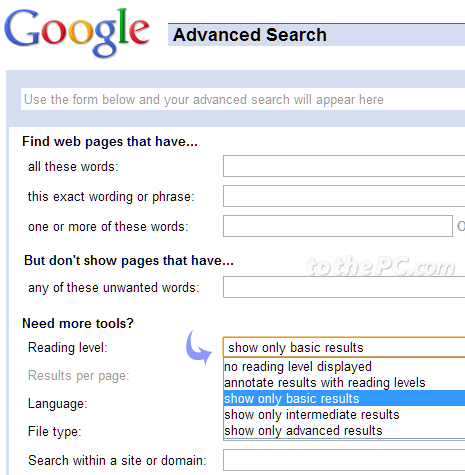 Now you can view Google Search results according to reading level requirements among: basic, intermediate and advanced. 1. 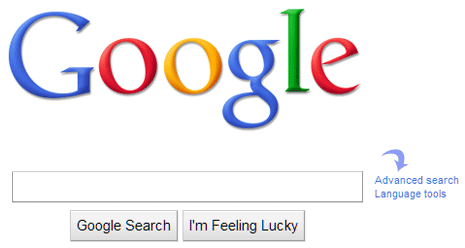 Open Google.com and click Advanced Search option next to search box. Alternatively, you can directly open Google Advanced search. 2. Look for “Reading level” option under “Need more tools?”. You can select either option among: show only basic results, show only intermediate results, show only advanced results from the drop down box. 3. Then type search keyword at top and click Advanced Search button at bottom right to view search results according to selected reading level. You can change the reading level setting for more basic or advanced search results for specific search keywords using this Reading Level settings on Advanced Search page of Google Search.